After Foundry Monoline released 2000 with its subtle square form and strong style I wanted to do an extremely neutral, no-nonsense typeface, very round and pure without, seemingly being over consciously refined; with letterforms that have no leanings towards humanistic scripts. Of course much work, as with any other typeface goes into refining weights, proportions, stroke widths and terminals, that in the end ends up in the larger sense humanistic. Humanistic in that it reaches back to before the Renaissance and more classical abstract idea of proportions. Foundry Context is a sans serif that tries hopefully and ‘pompously’ to be universal in all contexts hence the name Context. I wanted a typeface that would work well in large sizes and at the same time to work in small amounts of text. I worked Foundry Context for 3 years. It had been back and forth from my studio in Amsterdam to the studio in London every month or so, always new improvements and refinements to do. I think it is one of the most perfect typeface that we have ever done especially on the technical side to being drawn first in Fontographer in Amsterdam and then refined and technically produced in FontLab. 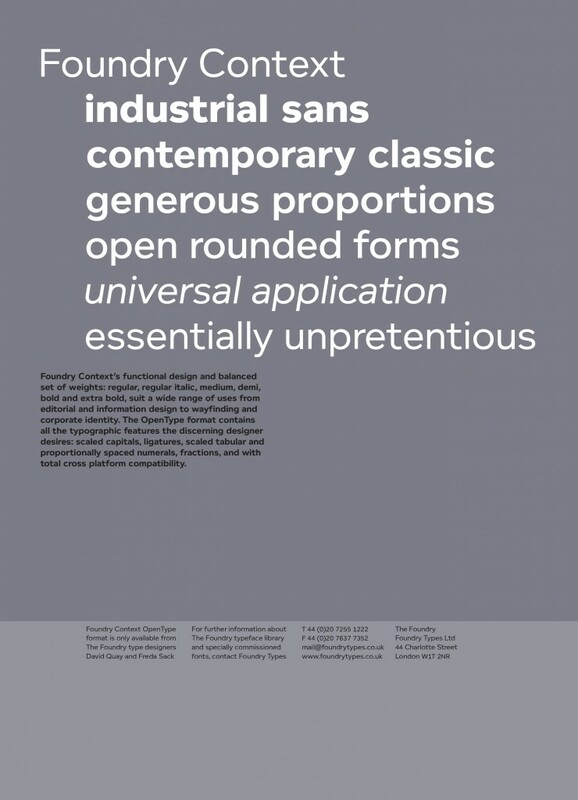 FontLab has the ability of making OpenType that Fontographer is yet do. I think it was one of the hardest typefaces to draw. The terminals on the C, G, J, c, e, f, g, t, for example do not flair and that was very hard to achieve. In the extra bold weight it was even harder.